The armor used by the Israeli Defense Forces has always been popular, as it generally has shown brilliant local reuse of either cast-off or obsolete vehicles or native genius in creating highly effective vehicles; many other countries have actually based some of their new armor concepts (such as heavy armored combat vehicles or HACVs) on Israeli designs. The Merkava (Chariot) tank began as a product improved design based on parts from the British Centurion and L7 105mm gun combined with the American AVDS-1790 diesel engine on a totally new chassis, which moved to an engine-front design with the smallest possible turret to protect the crew at all costs. The vehicle also had a rear access hatch and jump seats for recovery of personnel or wounded in combat while providing maximum protection. It made its combat debut in Lebanon in 1982. Since then the tank has evolved through three more evolutions, each more heavily armed and protected than the last. Today we now have the Merkava Mark IV, armed with the US M256 120mm gun, a .50 caliber M2HB machine gun for coaxial work or “pest control” of light armored vehicles, and a 7.62mm machine gun for the commander’s use. The tank has state-of-the-art sights and communications equipment, massive turret armor protection (weight is indicated as heavier than 62 metric tons) and other protective measures. The tanks have been in service for several years now but were first sent into combat in the disastrous raids on Hizbollah in Lebanon. 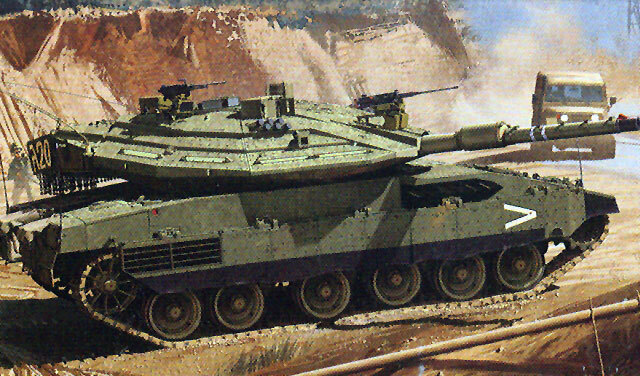 Academy has now released a new kit of the Merkava Mark IV; since they also had a Mark III (which I have not seen) I cannot comment on whether or not this kit is based on the earlier one. But from what I can tell this appears to be a “ground-up” new mold kit using slide molding and other state of the air techniques. The kit is very conventional in general layout, but shows its motorized origins with the now standard three holes in the belly of the hull for the motor mounts and remote control wire access. A plug is provided for the central cable hole, but not for the two motor mount holes up front. Also, while many of the smaller details are provided for the lower hull, the access hatch at the rear is a “false front” and cannot be displayed open without a lot of work in creating a interior and an inner face to the hatch. Given that, the rest of the kit is nicely done and very straightforward. The road wheel bogies are one massive unit with a rocker assembly that is attached but as they are springs will need careful cleanup. The road wheel pairs consist of four parts: rear wheel, vinyl keeper, front wheel, and separate rim with tire for definition; happily, the rims and tires are styrene and not vinyl so painting is not a problem. Modelers will be happy that Academy includes “link and length” tracks with the kit (curiously referred to as “semi-connecting tracks” on the box ends!) The main runs have no ejection pin marks but the “wrap” sections do, so a bit of cleanup or filling (modeler’s choice) will be needed on those. The track runs therefore comprise but 27 parts each. The turret is approximately 60% the size of the hull, and most of the detailing parts are used on it. The commander’s hatch may be positioned opened or closed, as can the gunner’s primary day/night sight doors. There are several antennas (parts B31) which I assume from what I know of the vehicle to be part of its battlefield control system interface (these are something new many countries are using such as the US system for brigade and below automated command and control). There are also several regular antennas plus a meteorological sensor mast and the turret basket. The coaxial .50 caliber has a slide molded bore and comes in a total of 14 parts including its mount, 17 if you count the ammo feed. Academy’s solution has been to make them as etched brass frets with the round portion attached from separately provided half sections (molded on the D sprue edges in what is now Academy’s standard style for small supplemental parts) for the modeler to attach with super glue. They provide 184 sections for 66 balls; as each ball takes two sections, they provide at least 50 extras as “sacrifices to the carpet monster!” I suggest added them BEFORE removing the ball sections (five to eight in a group) for attachment to the turret. A small section of decals is included, but as Academy notes you will have to add the canvas removable tactical panels from tissue with a soaking in either white glue or “soup” made of glue and plastic. Overall this is an outstanding effort and one which should be well received by IDF fans.